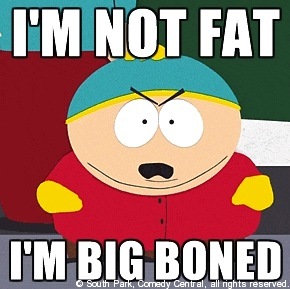 I’m Not Big Boned, I’m Just Fat! Today I hit one of my big goals for myself. I weighed in this morning at 233lbs and my BMI worked out to be less than 30 putting me no longer in the obese category but in the overweight bracket. So I am no longer obese, I’m just fat. I have a long ways to go to not being fat but it is great to get myself out of that extremely unhealthy level of obese which I have been in since I was a kid. Seriously, I am pretty sure I have been obese since I was 12. So it only took 23 years to get here but it feels good. My next goal is weight based and I am targeting my birthday. When I hit it I will announce it but I like making my goals more private until I make them and then celebrate them. This week is Dragon Con and I will be there from Wednesday till Tuesday. I was good about not killing my diet and weight last weekend when I was in Atlanta so I think I can make it through this weekend and not tank out my recent accomplishments. Even if I do I know I can readjust and get back to where I am no problem. Super proud of if, hun! You looked great last weekend. Also, hopefully it will help to have friends around also not trying to kill themselves on food this weekend… I really want to keep from going nuts, as well.